A vivid retelling of a major historical catastrophe written in an engaging, narrative style with direct speech and speech bubbles. Dramatic illustrations, photos or maps on every page and Internet links to fun websites via the Usborne Quicklinks Website. The Usborne Reading has been developed in consultation with Alison Kelly, Senior Lecturer at Roehampton University. 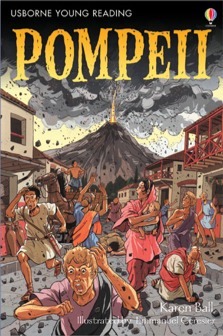 The Pompeii book was a massive hit with both my kids and great reading practice for my daughter. I like this book because it was really interesting and I got really into it, I never want to go near a volcano ever! We actually used this book to tour the excavations at Pompeii in Italy. My six year old son had read the story many times before we went and when we were there we used the map to find all of the places mentioned, really bringing the visit to life and enabling us to see what the different ruins would have looked like before the eruption. Well done Usborne! I enjoyed this book as it told me the story of how families struggled in Pompeii when Vesuvius erupted. The book explained the events and times from the volcano erupting in AD79 to the excavations and treasures found by Giuseppe Fiorelli in 1860. I like the great maps and plans in the book. This book was really sad and exciting because it tells the story about a volcano called Vesuvius that erupted and destroyed everything, and exciting because it told me lots of facts about the past! I would give this book 10 out of 10. Excellent!